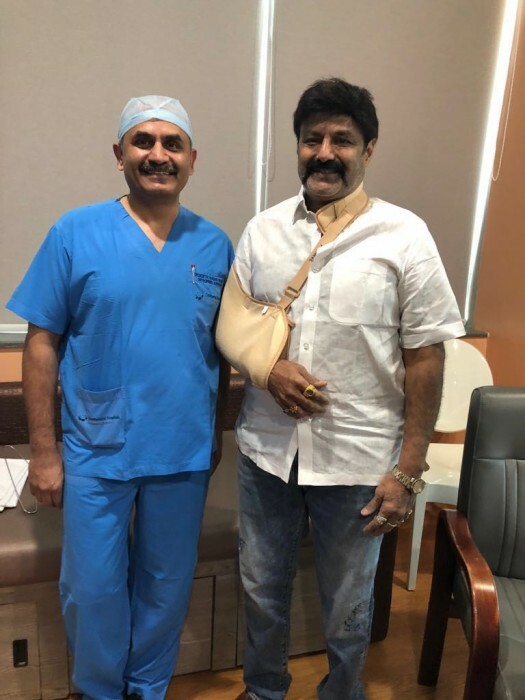 Veteran Telugu star Nandamuri Balakrishna recently underwent a surgery to fix a torn rotator cuff. Veteran Telugu star Nandamuri Balakrishna recently underwent a surgery to fix a torn rotator cuff. He had apparently picked up the injury while shooting for Gautamiputra Satakarni but could not undergo surgery back then because of his packed schedule. After spending a couple of days in a popular hospital he was discharged much to the delight of his well-wishers. We wish NBK a speedy recovery and hope that the ‘Lion’ starts roaring once again. Interestingly, Balakrishna is going through a good phase on the professional front right now. Last year, he tasted success with the above-mentioned Gautanmiputra Satakarni and also received rave reviews for his performance. A historical drama, it was directed by Krish and saw him essay the titular role. Also featuring Shriya in the lead, it served as strong proof of NBK’s acting abilities. His second release of the year was Paisa Vasool. A commercial entertainer, it saw him essay a massy character and opened to a decent response at the box office. It was directed by noted filmmaker Puri Jagannadh and had Shriya-Kyra Dutt in key roles. NBK was last seen in the big Sankranthi release Jai Simha. And, not surprisingly, the KS Ravikumar directorial opened to a good response at the box office despite receiving negative reviews. In the action-drama he was seen alongside Nayanthara and two impressed fans with their crackling chemistry. Shortly after its successful opening, NBK had said that he does not attach a lot of importance to success or failure. “Today film distributors come from different places and they are happy. I work hard for every film and some of them may be successful while the others may fail. Neither do I let the successes get to my head nor do I sit on the failures. I just focus on my work,” he had told a daily. At present, he has NTR in his kitty. It is based the life of his dad/former Andhra Pradesh CM NTR and is being directed by Teja.